Forward cabin. 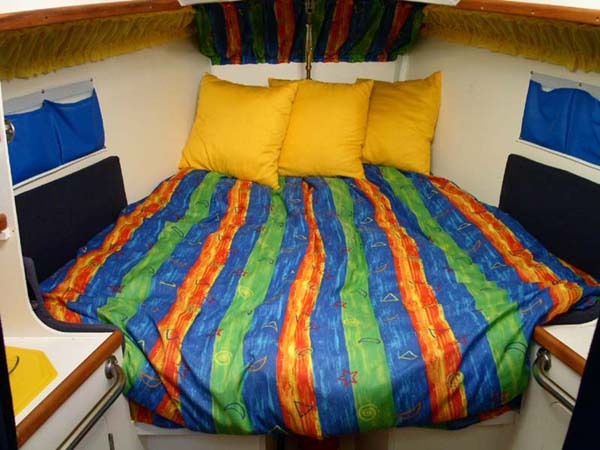 Good size double v-berth, thick foam mattress, fitted sheets. 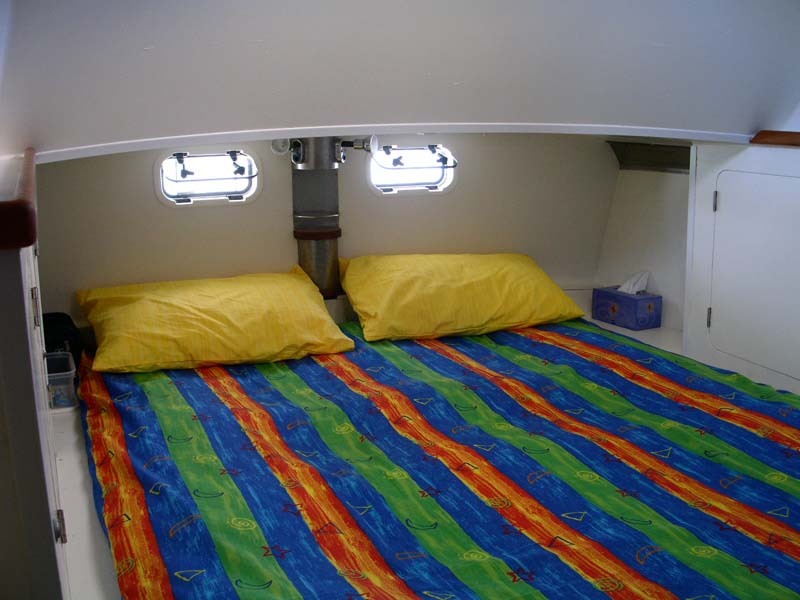 Three separate storage compartments under the bed. Two cupboards and two sets of shelves. Assorted storage pockets. Large opening hatch above. One under floor storage compartment. Curtains for privacy and maximum air circulation. Saloon. Dining table on telescopic pedestal. 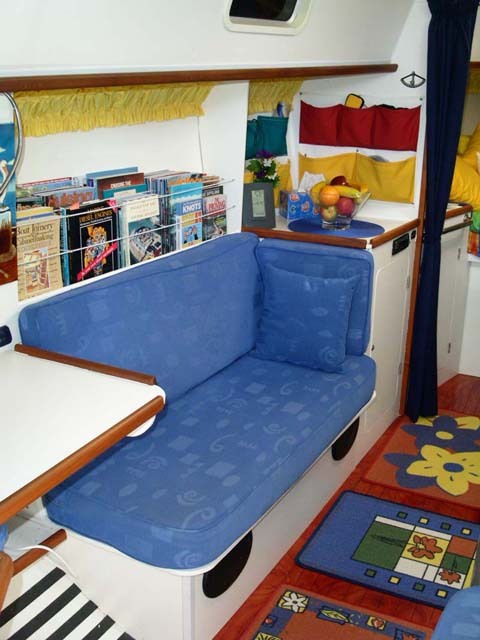 Starboard side U-shaped settee with storage behind and under, fitted with a lee cloth (adult single berth), convertible to a double by lowering table. 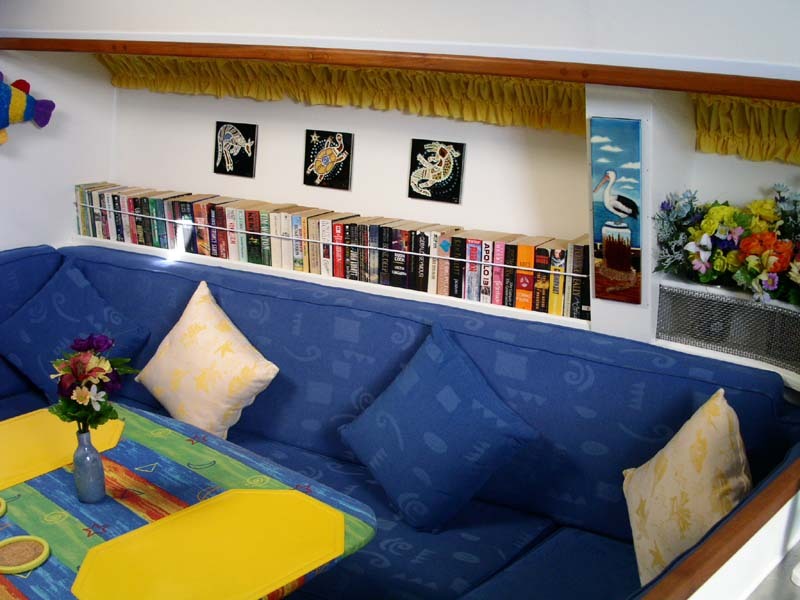 Starboard side bookshelf. 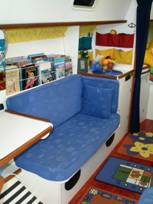 Port side, straight short settee with storage behind and under, fitted with a lee cloth (child single berth or gear storage area for overnight sailing). 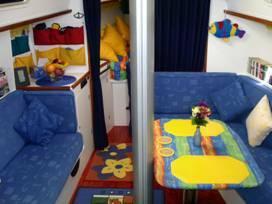 Port side cupboard and bench. 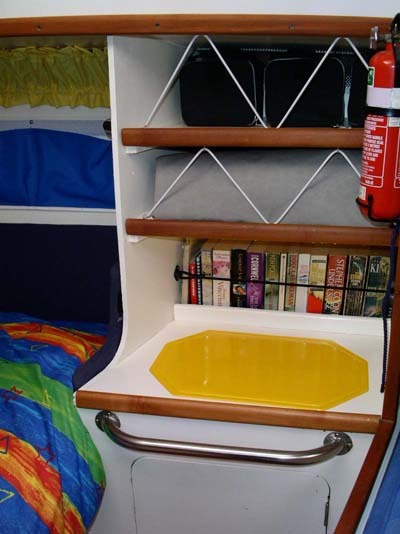 Port side magazine and book rack. Assorted storage pockets. Large opening hatch above. 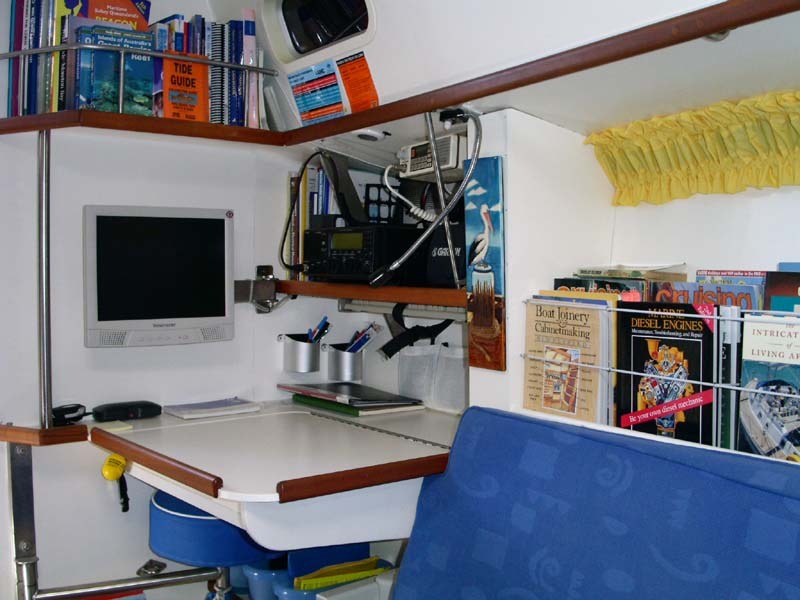 Navigation station aft of port settee. 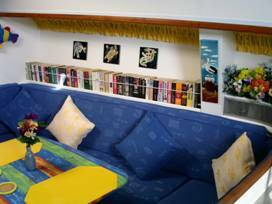 Galley aft of starboard settee. Forward cabin seen from the saloon. Navigation station. 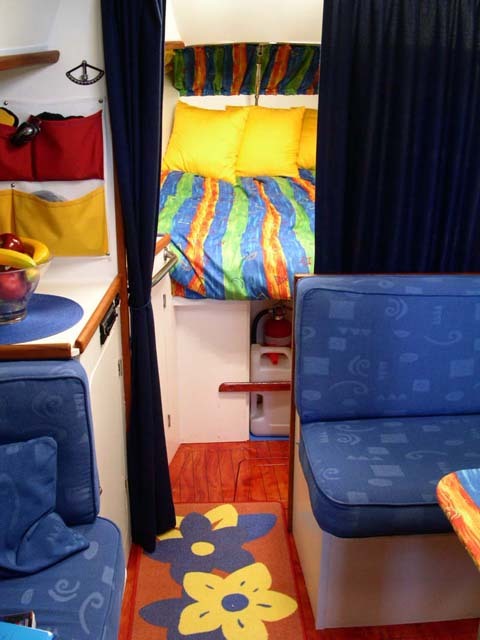 Port side, aft of the port settee. Sit down style with swing out seat. Full-size chart table with storage for charts folded in half underneath. Several storage compartments, an instrument shelf, and two overhead bookshelves. Laptop & mounting system (not shown) and external monitor with built-in speakers. Head and shower. 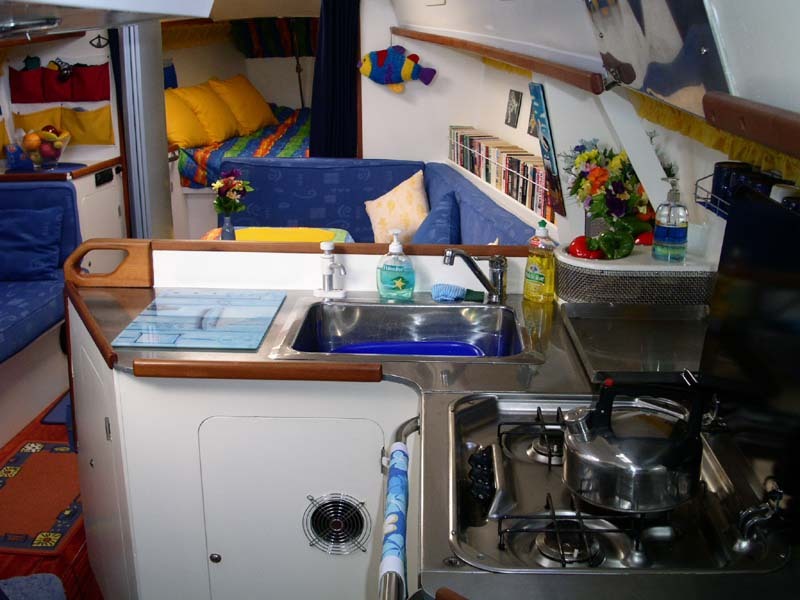 Port side, adjacent to the companionway. Enclosed. One opening port. Separate compartments for head and shower, divided by shower curtain. 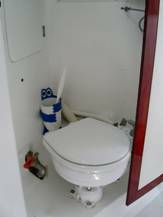 Shower has hot and cold pressurised water, mirror, hand basin, two small cupboards and a small seat. Can be used as a wet hanging area. 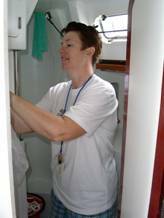 Head has a mirror, four small cupboards, one large cupboard, a large cleaning products locker and a large laundry locker. Bread baked in the outside BBQ / oven. Galley. L-shaped, starboard side, adjacent to the companionway. 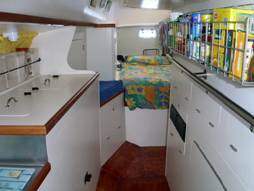 Well placed for handing food and drink into the cockpit when sailing. One opening port. Five cupboards and one locker. Stainless steel bench tops. SMEV stainless steel stove top, three burner, gas, with adjustable tilt angle, removable pot holder and safety rail. Indoor oven: 240v microwave (shore power only unless a more powerful inverter is installed). Outdoor oven/BBQ: combined gas BBQ/oven with temperature gauge, mounted on stern railing. Ideal for bread, cakes, etc. Being outside, it does not heat the boat in warm weather. 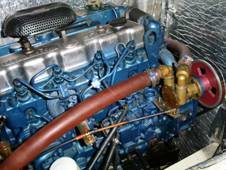 Gas detector and safety shutoff system by BEP Marine, with sensor in the bilge. 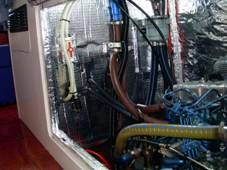 Controls a safety shut-off solenoid in the gas bottle locker. Gas bottles: two 9kg galvanized bottles in stern lockers. Sufficient for two people for six months. 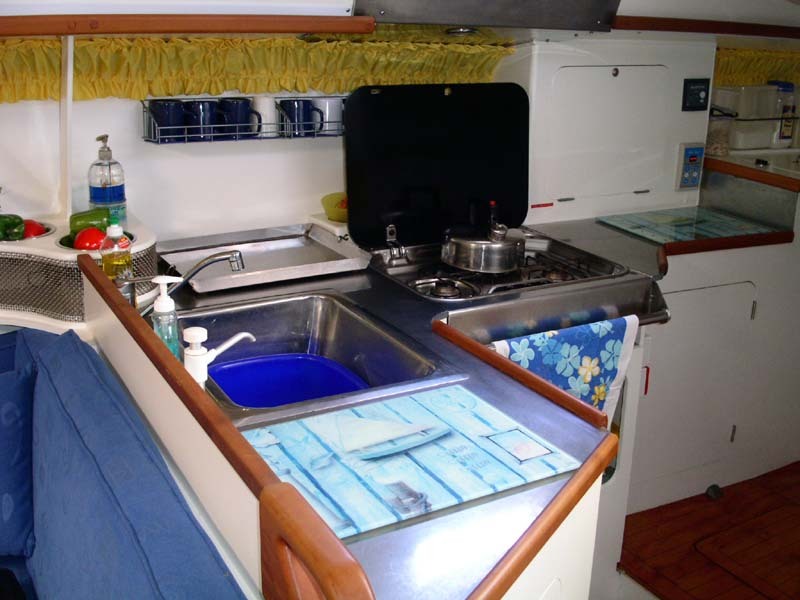 Sink: single, stainless steel, large. Pressurized water tap and separate hand pump. Dish draining rack. Walkway. On starboard side, leads to the aft cabin. Contains numerous racks for spices and other commonly used small food items. 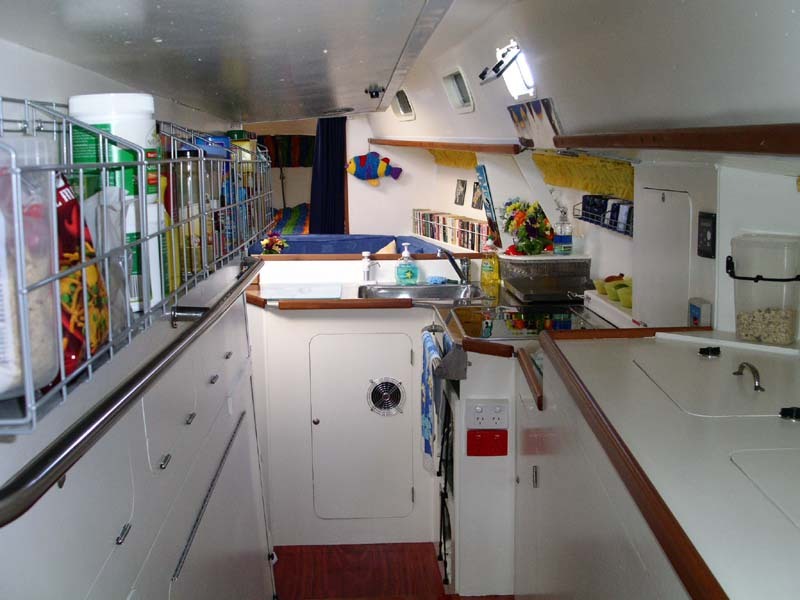 Also three long cupboards with stainless steel dividers designed for storing a large quantity of canned food. 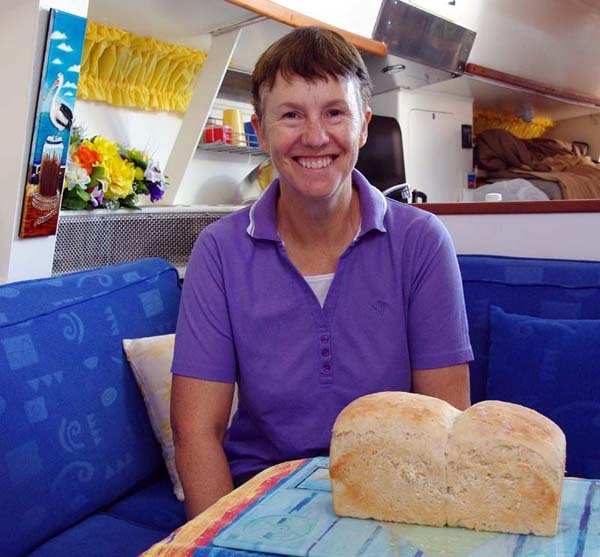 Two refrigeration boxes on the hull side, with bulk storage containers above (muesli, flour, rice, etc). Fridge controller and Gas detector controller. Walkway and Engine Room. 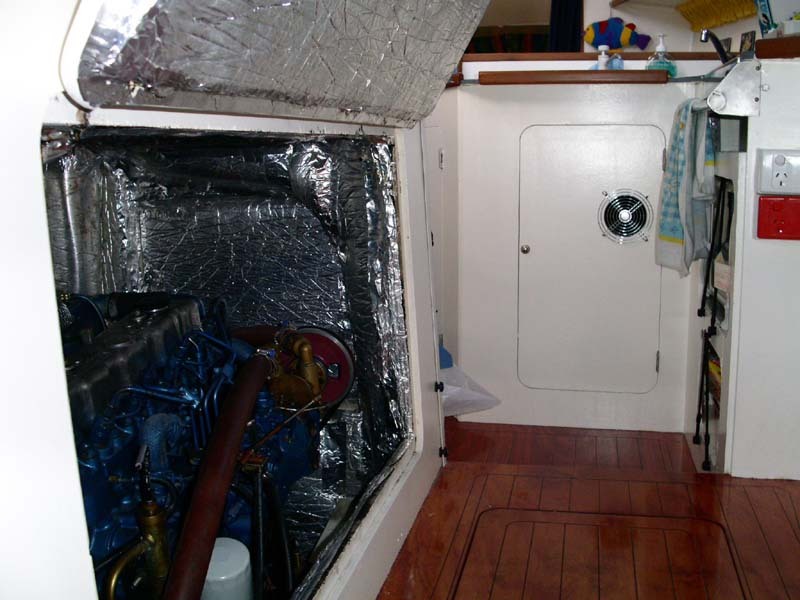 Main access to the engine, gearbox and stern gland via a large fully insulated swing-up door. Engine components requiring regular checking and/or servicing easily accessible from the walkway via this door. 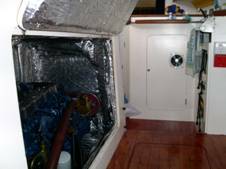 Access to the front of the engine by a removable panel under the companionway. 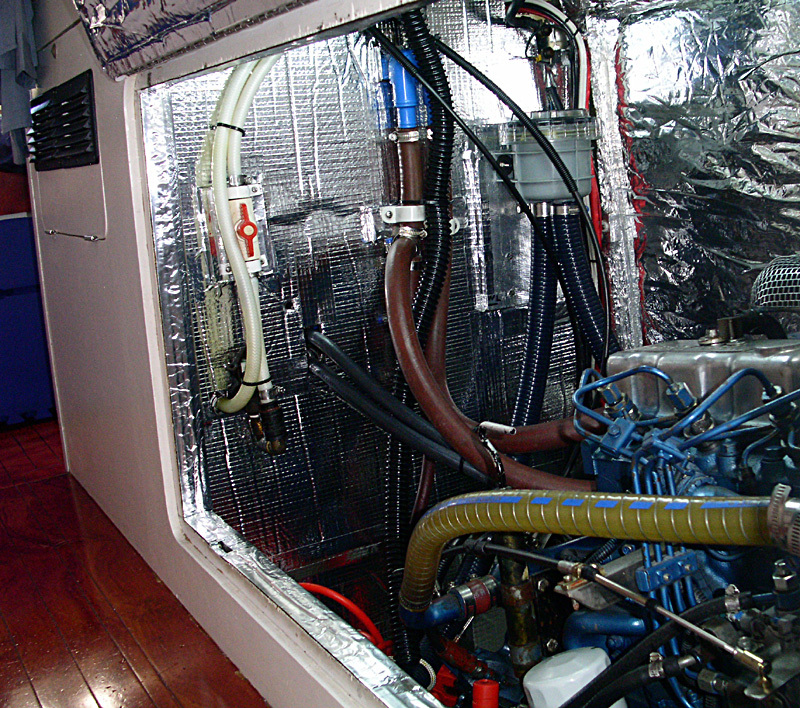 Access to the port side of the engine via a bi-fold door in the storeroom. Aft cabin. Owners cabin, larger and more comfortable than many bigger boats. No climbing over your partner to get in and out of bed. Standard queen-size futon, with fitted sheet. Two opening ports. One large opening hatch above. 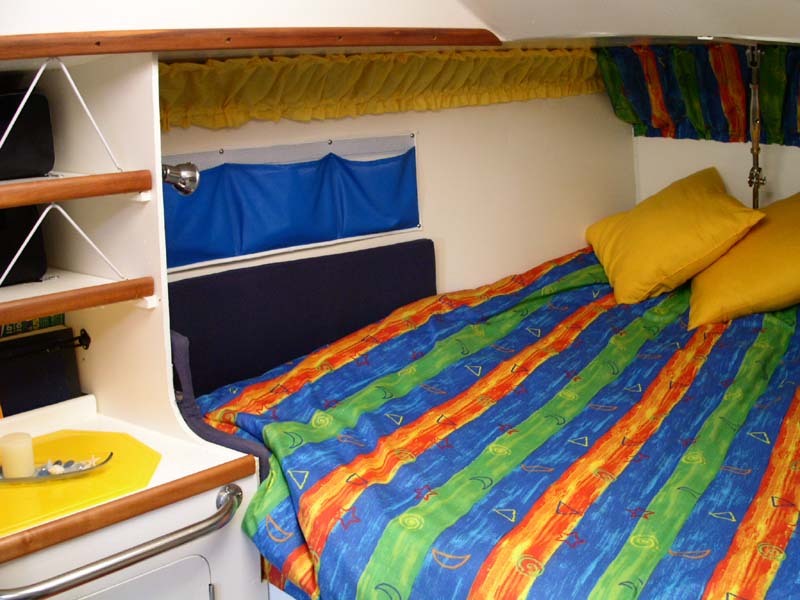 Three separate storage compartments under the bed. 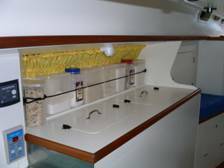 Two large clothes cupboards with shelves, and a hanging cupboard, port side. Two large clothes cupboards with shelves, a linen cupboard, and a shoe cupboard, starboard side. Padded dressing seat. Assorted storage pockets. One under-floor storage compartment. Curtain for privacy and maximum air circulation. 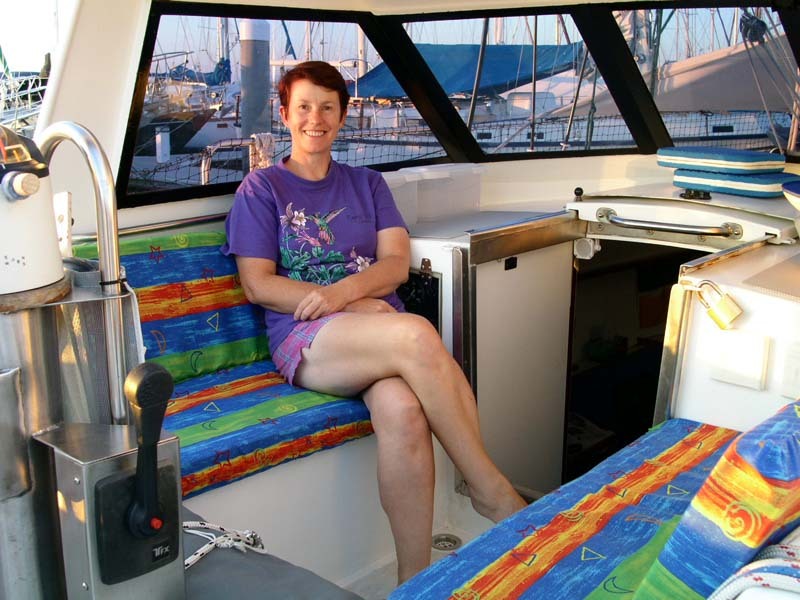 The large doghouse makes a comfortable outdoor lounge room when the cockpit cushions are fitted.